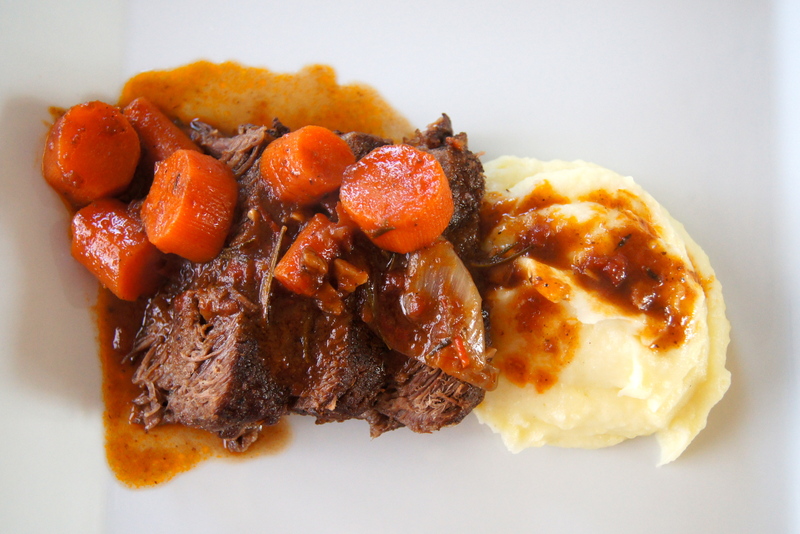 Prepare yourself to throw away your old, beaten up, used and abused pot roast recipe. One bite of this and you’ll never go back. It’s simple and absolutely delectable; and you may end up wanting to bathe in the sauce…it’s just that good. I serve this with whipped potatoes but you can just as easily throw in quartered red potatoes with all of the other veggies and you’ll have yourself a one pot meal. Sundays finest, indeed. Preheat oven to 275. In a large ovenproof pot or dutch oven heat olive oil over medium high heat. Add roast and brown until a nice crust forms, about 3 minutes. Flip it over and brown the other side for an additional 3 minutes. Pour in red wine, water and tomatoes and stir as best you can around the roast. 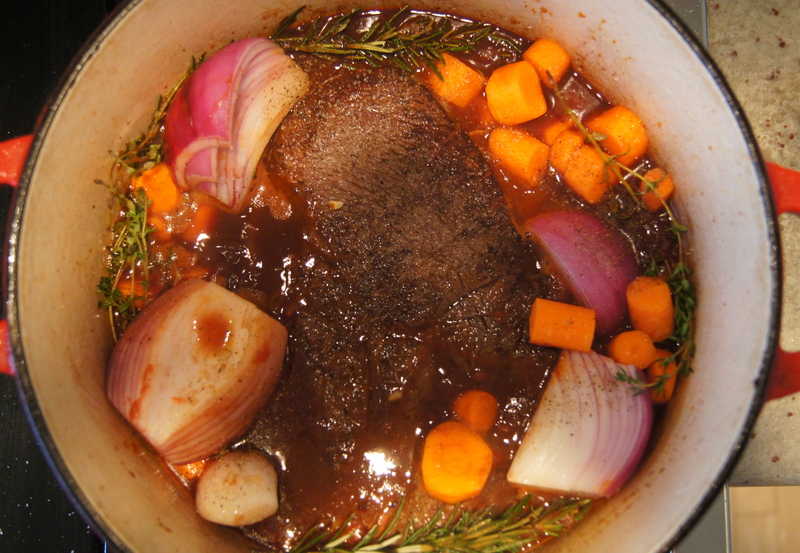 Tuck carrots, onion, garlic, thyme and rosemary into the liquid around the roast and sprinkle with the salt and pepper. Bring to a simmer, cover and transfer to the oven. Cook for about 3 hours or until roast is very tender, basting every 30 minutes. Remove from oven and transfer the roast to a plate. Boil the remaining liquid and veggies over medium heat until it thickens slightly, about 5 minutes. Slice roast and serve with the sauce on top.